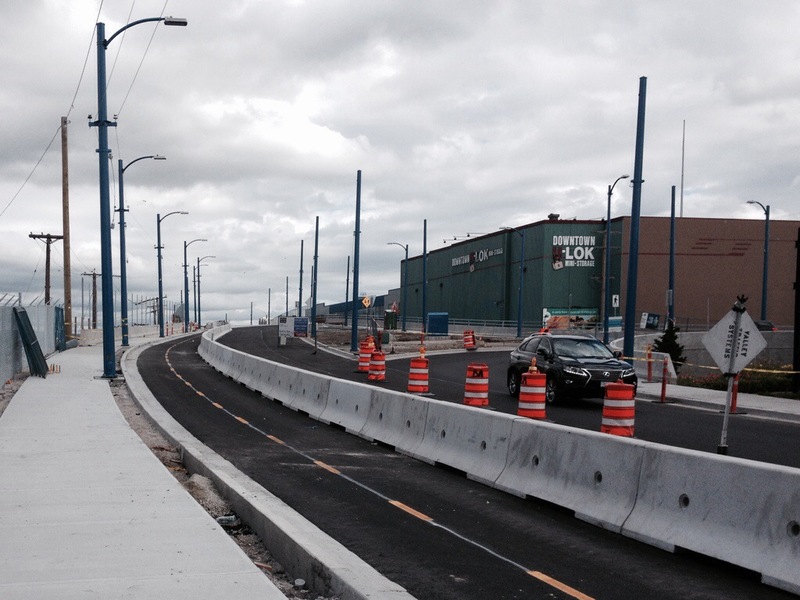 The $50 million Powell Street Overpass, expected to be completed in early August, will have a separated bike path on the north side stretching from Hawks Avenue to Clark Drive. This will be a big improvement for cycling in this part of town. Unfortunately, there not yet a good cycling connection west of Clark. Vancouver’s Transportation Plan included a cycling connection from Clark to McLean but it is uncertain when it will be completed. The $105 million proposed for renewal of transportation infrastructure in the draft Capital Plan includes funding for the repair of Water Street. The renewal of Water Street will be the ideal opportunity to improve it for cycling by either adding cycle tracks or by closing the street to through commuter traffic. This along with improvements to Powell and Alexander, would complete the Portside Greenway giving residents and tourists a great connection to East Vancouver, Burnaby and the North Shore. A good idea to let the candidates in the upcoming election know that completing the Portside Greenway is a priority. The Point Grey Cornwall Greenway, by completing the Seaside Path, will open up the West Side waterfront enabling people of all ages and abilities to enjoy Vancouver’s beautiful scenery by bicycle while giving both locals and visitors access to Kits Beach, Jericho Beach and Spanish Banks. 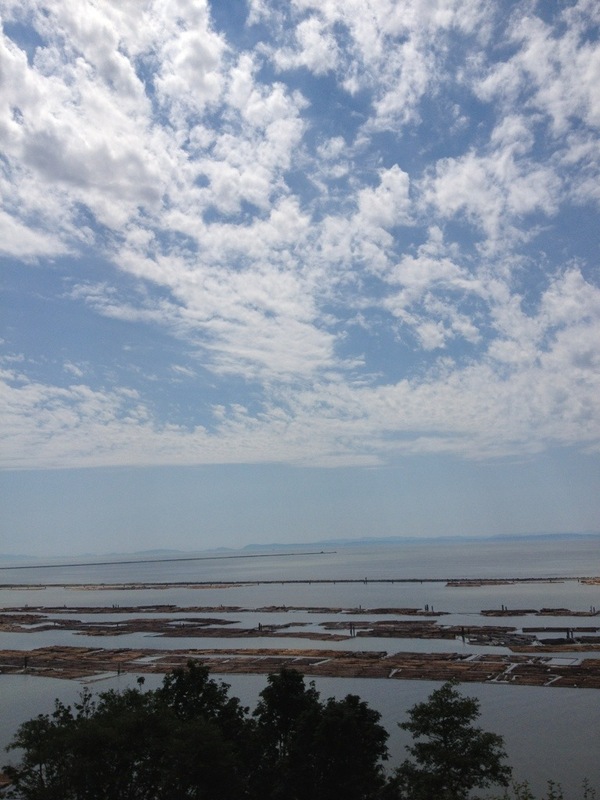 Further on there is the Museum of Anthropology, UBC Botanical Garden, Nitobe Memorial Garden, Wreck Beach, Pacific Spirit Park and paths along the Fraser River. Hundreds of thousands of residents and tourists cycling along the Greenway will help boost business at restaurants, cafes and stores in Kits. Vancouver’s $3.7 billion tourism industry is critical to our economy. Vancouver’s new Tourism Plan identifies, Cycling, the Seawall & Beaches and Health/Wellness as part of its recommendation to initiate a product development strategy. The Plan also identifies Public Bike Share as part of the transportation infrastructure needed to support tourism. Cycling tourism in Oregon accounts for $400 million of the state’s $9 billion tourism industry. There is likely similar potential in B.C. Pretty much every article on what to do when visiting Vancouver, mentions getting on a bike. The most common recommendation is cycling around Stanley Park but more and more are mentioning the separated bike lanes and exploring other parts of the city by bicycle. 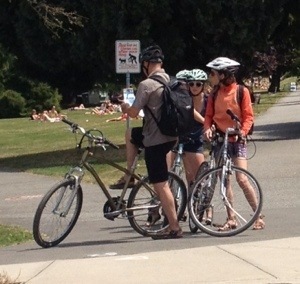 Judging by the number of people taking photos from the Burrard Bridge and looking at maps along Pt Grey Cornwall, this part of town is getting to be a popular place for visitors to cycle to. 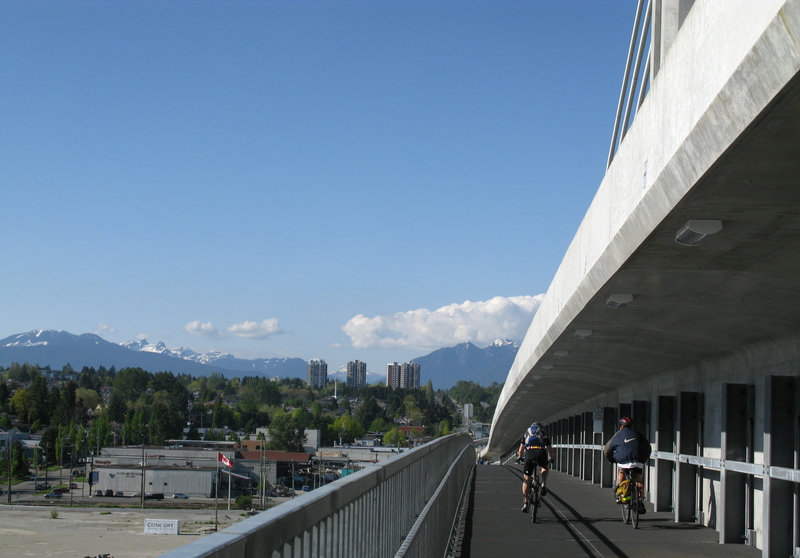 Ride the Seawall, a paved route for bicyclists and pedestrians, in the heart of the city. For adult fun, veer off the path into the trendy Yaletown neighborhood that’s packed with restaurants, coffee shops and bars. Hungry? Stop for a bite at the trendy Cactus Club, which opened this spring right on the sand at English Bay Beach. The city has now steadily expanded the bike network to circle the entire West End and two bisecting cycletracks now offer comfortable riding through downtown. On another day we headed east to Commercial Drive, a lively eating-and-drinking street that reflects the city’s rich immigrant diversity. Seems like everyone except the businesses that would benefit the most are noticing Vancouver’s cycling tourism potential. Even tourism operators in other city as witnessed by this article More and more travellers taking a spin on bicycle tourism in Montreal. All the possibilities clearly have Mayer thinking of exporting the bike-tourism concept to other cities in Canada and beyond. … Vancouver is a market that clearly has his interest. “We have better climate, longer seasons,” he said of the coast city. A recent visitor from Melbourne really said she really liked Vancouver’s bike lanes. I was dreading the trip through the city but the separated bike lanes on the Burrard Bridge and along Hornby made this part of the trip most enjoyable and I felt safe. Judging by the number of people we saw on bikes poring over a map, this is becoming a popular tourist activity. What a wonderful way to see Vancouver and get some exercise. Given the economic importance of tourism, it is rather surprising that Pt Grey Cornwall Greenway is not more strongly supported by the Kits Chamber of Commerce and some of the local business that stand the most to gain from more visitors and locals cycling by. Instead of worrying about losing a few parking spaces on Cornwall (which is not even in the current proposal), they should be really upset that the city is attempting to divert all these stomachs on wheels up York away from their businesses. This is perhaps not entirely unexpected as the City has yet to integrate tourism into its bicycle route planning. In this case, tourism is not featured anywhere in the City’s materials on Cornwall Point Grey. When the separated bike lanes come, some businesses look to take advantage of the full advantage opportunity. 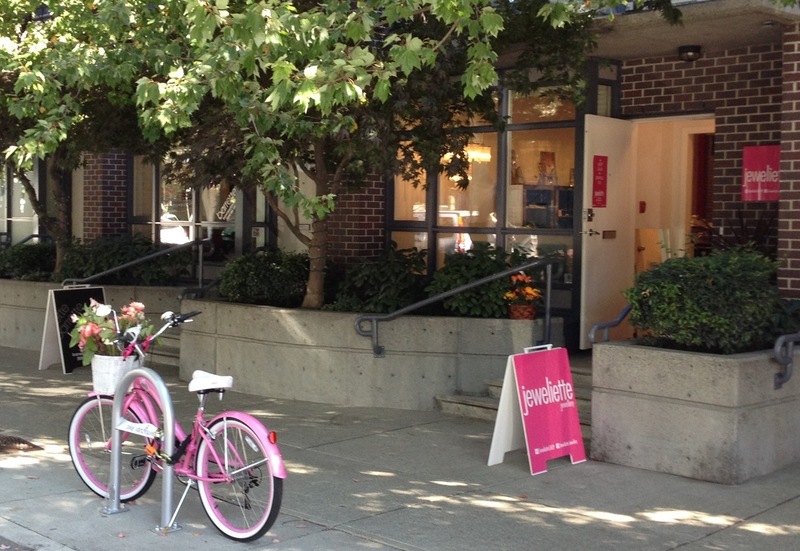 Jeweliette Jewellery (love the name), on Hornby between Nelson and Helmcken has a pink bike parked in front with flowers in the basket. Owner Madalena Corsi loves having bike lanes in the neighbourhood and says many customers arrive by bicycle. 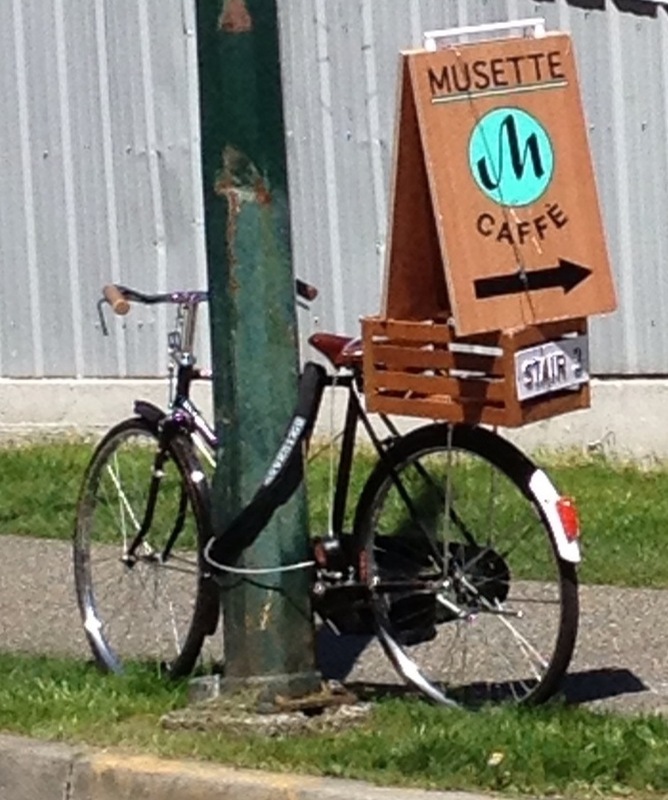 Musette Caffè is a bicycle friendly cafe that ironically is in the middle of an auto lot on the alley between Hornby and Burrard north of Drake. 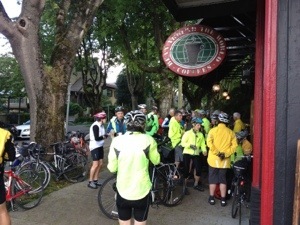 They serve great coffee and baked goods and are a popular meeting spot for people on bikes. Bike rental shops are also popping around the Convention Centre up at the north end of the separated bike lanes. Once the Pt Grey Cornwall Greenway is complete, businesses will likely take advantage of that opportunity as well. Unfortunately, it does not appear as if tourists, many local recreational cyclists or beach goers have yet been really considered in the planning process. It is not apparent how people will cycle from Burrard Bridge to Kits Beach and back again. I suspect most will just ride on Cornwall battling the traffic or ride on the sidewalk. Detouring up to York for just two blocks crossing busy Cornwall twice doesn’t seem likely. Having got really lost cycling around Paris a couple of times, I can attest to the importances of obvious direct bicycle routes when visiting a city. Signage and maps are great but they are no substitute for obvious. York It is not very likely that tourists will use or even find York. They will also want to grab a snack or have a drink at the businesses along Cornwall. There are great views of the city, mountains and ocean from Burrard Bridge. It is quite common to see people taking photos from the Bridge sidewalks. Burrard Bridge is a much faster route from hotels downtown to the beaches. The bicycle traffic levels on Burrard also peaks in July and August at almost 6,000 trips per day while Hornby and Dunsmuir are fairly steady from June through September indicating that a lot of beach and recreational trips are made on Burrard. Many sure look like they are going to the beach. 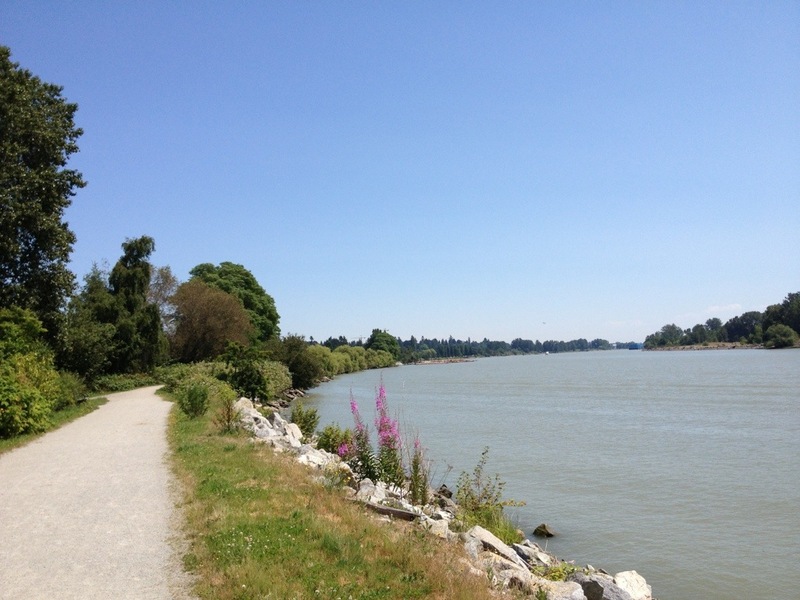 The Seaside Path around False Creek from Sunset Beach to Kits Beach also needs tens of millions of dollars in improvements to address safety and capacity issues including creating separate bicycle and pedestrian paths in many sections. Not really a great idea to encourage more people to use these sections until improvements are made. Meanwhile, the Hornby and Burrard Bridge separated bike lanes have plenty of capacity, are separated from pedestrians and with the exception of Burrard and Pacific, have relatively few cycling collisions. Providing a direct cycling connection along Cornwall to Point Grey seems like the least expensive short term solution for cycling tourists. 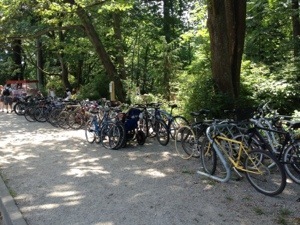 In Barcelona, shared bikes are a very popular way to get to the beaches. From Granville Station, Kits Beach is a nice quick ride away via Dunsmuir, Hornby, Burrard Bridge. Bike sharing, which will be going in early next year, should prove to be a game changer for bikes and businesses. In other cities, businesses have clamoured to get a station near by. A University of Minnesota study found that bike share users in the Twin Cities make more trips to and spend more money at nearby businesses including restaurants, coffee shops, bars, nightclubs, and grocery stores. When bike sharing does finally appear later this year, businesses, including those along Cornwall, might indeed be wishing they had separated bike lanes in front of them to encourage bicycles, shared and otherwise, to deliver customers to their doors. So, please encourage the City of Vancouver to build the Point Grey Cornwall Greenway now and speed up the implementation of other badly needed all ages and abilities cycling and walking improvements. Lets realize the health, safety, environmental, social and economic benefits of as soon as possible! Tell them the problems that you have experienced along Point Grey & Cornwall and let them know what the Point Grey Cornwall Greenway would mean to you, your family and community. 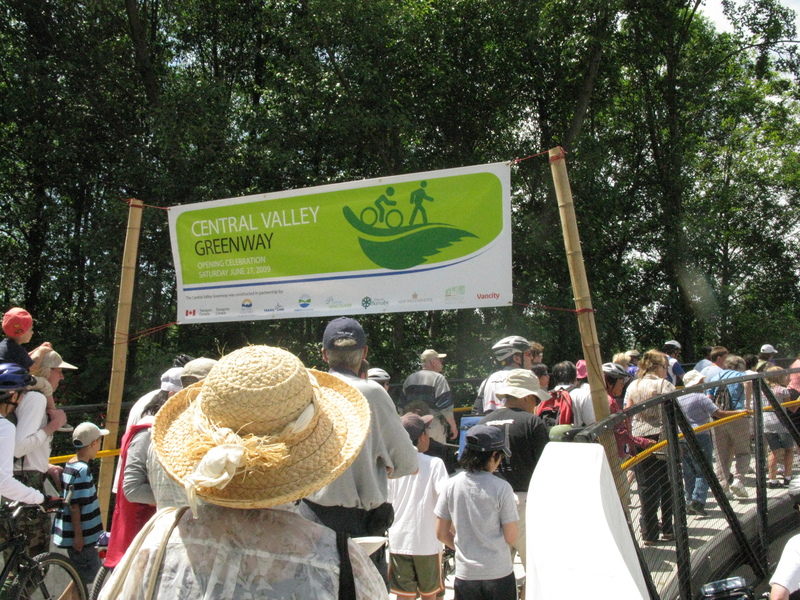 Write Mayor Gregor Robertson and Council <mayorandcouncil@vancouver.ca> in support of the Point Grey Cornwall Greenway. 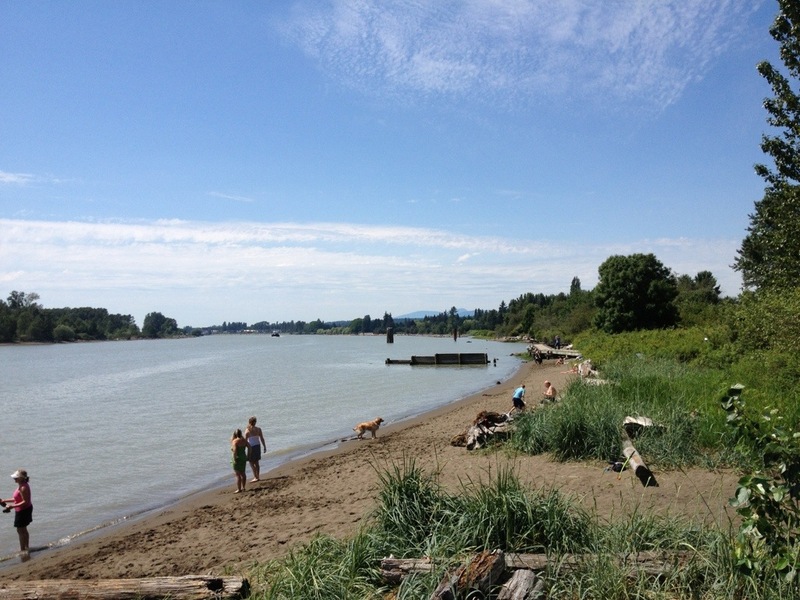 The Point Grey Cornwall Greenway will mark the completion of the Seaside Path in the West Side of Vancouver. 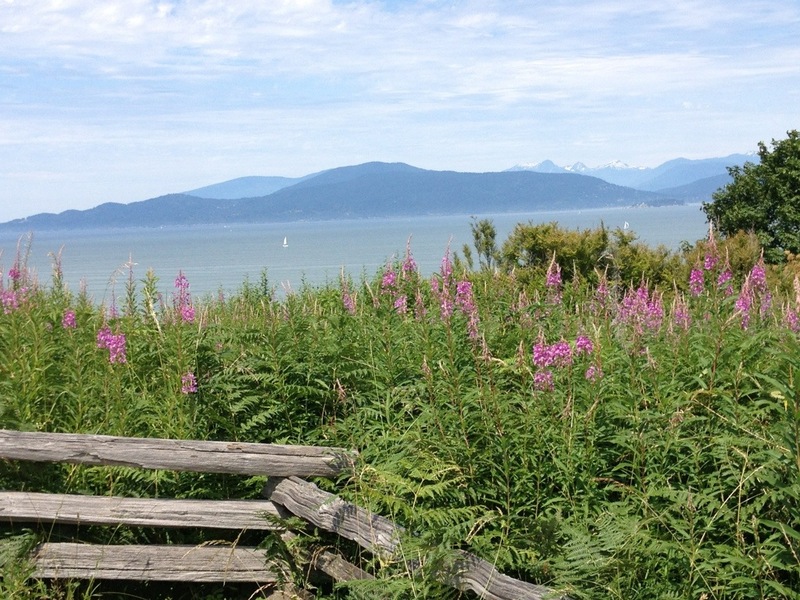 As with the rest of the Seaside Path, every year it will be enjoyed by hundreds of thousands of residents and visitors of all ages bringing customers to businesses in Kits and Point Grey. The well funded and organized opponents of the Point Grey Cornwall Greenway are complaining that the city is moving too fast and want them to slow down the implementation of these badly needed improvements. Twelve years after the 2001 False Creek Pedestrian & Cycling Crossings Study recommended improvements to all three bridges, Burrard Bridge is the only one that has been improved. So, by slowing down, what do the opponents of all ages cycling on Point Grey Cornwall mean? One year, five years, twenty years? Never? Today’s children should be able to cycle safely around the city while they are still children. Other cities are moving way faster than Vancouver in implementing separated bike lanes that are safe and comfortable for people of all ages including children and seniors. Seville perfectly demonstrated the advantages of rapidly building cycling facilities. In four years, they invested $42 million to complete a network of 78 km separated bike lanes throughout the city. In addition, they also installed a 2,500 bicycle bike sharing system. As a result, bicycle mode share increased from 0.2% to 6.6% and cycling trips increased from 2,500 to 70,000 per day. Perhaps more importantly, it is now quite common to see children cycling in the city. The City of Sydney is investing $71 million over 4 years to build a 200km cycling network including 55km of separated cycleways. Currently one per cent of trips into the city are made on bicycle – the city aims to increase this number to 10 per cent by 2016. So, please encourage the City of Vancouver to build the Point Grey Cornwall Greenway now and speed up the implementation of other badly needed cycling improvements. Lets realize the health, safety, environmental, social and economic benefits of cycling as soon as possible! Tell them the problems that you have experienced along Point Grey & Cornwall and let them know what the Point Grey Cornwall Greenway would mean to you, your family and community.